This garlicky shrimp recipe is delicious and so easy to make that it will quickly become one of your go-to dishes—for both busy weeknights as well as special occasions. The beauty of this dish is that it can be served many ways: tossed with pasta as in this recipe, served over rice or couscous, or simply plated as is with a side of crusty herb-buttered bread. Whichever way you serve this dish, it will always be a hit! Bring a large pot of salted water to a boil. Add the pasta to the boiling water and cook according to the package directions, or until al dente. Before draining, reserve 1/3 cup of pasta cooking water. While the pasta is cooking, heat 2 tablespoons of the oil in a large skillet over medium heat. Add the shrimp in a single layer. Sprinkle with salt and pepper. 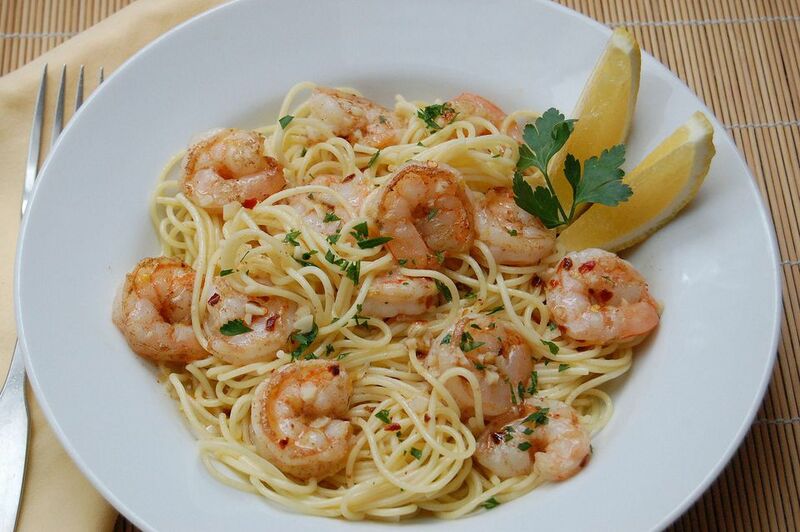 Cook for 2 minutes, turn the shrimp over, add the remaining tablespoon of oil, the garlic, and red pepper flakes. Stir constantly for 1 to 2 minutes. Add the lemon zest and white wine to the shrimp. Stir and let the wine reduce slightly. Stir in the lemon juice. Ladle the pasta cooking water into a large serving bowl. Drain the pasta and add to the bowl. Pour the shrimp with the sauce over the pasta. Add the Parmesan and pine nuts, if using, and toss to mix and coat. Serve with a drizzle of olive oil and extra red pepper flakes on each serving, if desired. To toast pine nuts, spread them in a small heavy skillet and cook over low heat for 3 to 5 minutes, shaking the pan frequently, until light brown. Dried pasta can be stored in an airtight container in a cool, dark place and it will keep almost indefinitely. However, dried whole-wheat pasta should be used within 1 month. Fresh pasta should be wrapped tightly and refrigerated up to 5 days, or double wrapped and frozen up to 4 months. Frozen pasta does not have to be thawed before cooking. Looking for the best dinner recipes? Get our free cookbook when you sign up for our newsletter.